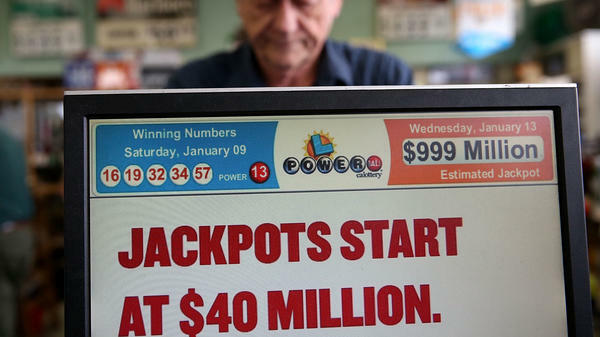 On Jan. 13, 2016, a cashier sells Powerball tickets in San Lorenzo, Calif. Later that day, three winning tickets split the record $1.6 billion jackpot. Wednesday's $758 million jackpot is the largest grand prize won by a single lottery ticket in U.S. history. "I've called them and told them I will not be coming back," Wanczyk said at a news conference Thursday, drawing laughter and applause from those present. Wanczyk said she was about to leave work last night when a friend told her the winning numbers had been announced. "I know it's never going to be me, it's just a pipe dream I've always had," Wanczyk recalls saying. But then her friend, a fireman, began to read off the numbers, and it dawned on Wanczyk that she had all of them. The reality of her new wealth is still settling in, she said. "I'm scared, but I'll be OK," Wanczyk said. As for what she'll do now, Wanczyk said, "The first thing I want to do, is just sit back, and relax." Wanczyk said she chose her numbers based on birthdays and the number 4 — based on the people, including her mom, who are in her regular Friday-dinner group. Massachusetts State Lottery officials initially said the record-setting ticket was bought in Watertown. But the agency issued a correction early Thursday, saying that the Pride Station & Store in Chicopee had sold the ticket — not the Handy Variety convenience store in Watertown. It is the largest grand prize won by a single lottery ticket in U.S. history, according to a statement from Powerball Product Group Chair Charlie McIntyre. The jackpot is also the second-largest lottery prize in the U.S. In January 2016, the record jackpot was set at $1.6 billion — but that pot of money was split three ways. The odds of winning the jackpot were one in 292.2 million. It's not known yet who bought the lucky ticket. It's the fourth time a Powerball jackpot-winning ticket has been sold in Massachusetts. Previous winning tickets were sold there in 2013, 2012 and 2011. Six tickets for Wednesday's drawing won $2 million apiece, and 34 more won $1 million, the lottery organization says. The winning numbers were: 6, 7, 16, 23 and 26, and the Powerball number was 4. Powerball is played in 44 states, as well as in Washington, D.C., Puerto Rico and the U.S. Virgin Islands. Each time there is a winner, the jackpot resets. Saturday night's Powerball jackpot is $40 million.